I race for bling. I'm super transparent about this. My medals are very important to me. Sure, they're just trinkets that cost pennies on the dollar, but they represent hours upon hours of work and sacrifice and research and conversations. I have my medals hanging up in the basement with race posters and photos to remind myself what I've accomplished. It's a nice boost when I'm feeling down or wondering why I'm awake at 5 a.m. again to workout. So it's only natural that I take care in how they're displayed. I got my Allied Medal Hanger two years ago and have proceeded to fill it with memories and mementos. I love the way it looks, the message and the company. I was excited to see the revamped MedalHangers.com, which now includes a very nifty customizer tool. 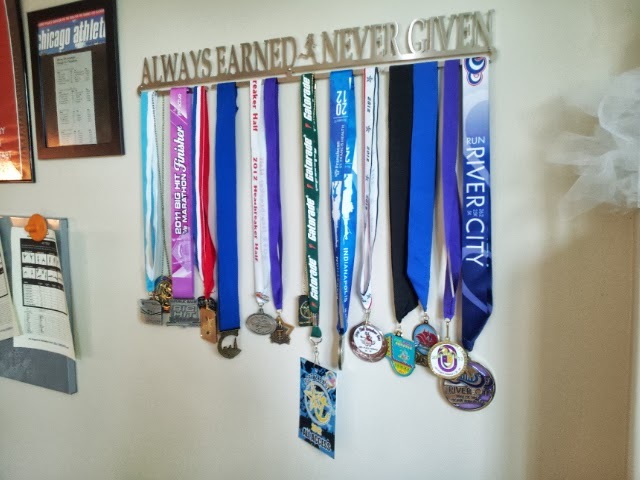 In honor of this new gadget, which allows users to choose from a plethora of display options to create the perfect medal holder, Allied Medal gave me a $50 giftcard to raffle off. I love this tool - you can mix fonts, add images and logos, move things around, change the height and width and add room to grow with up to three bars. 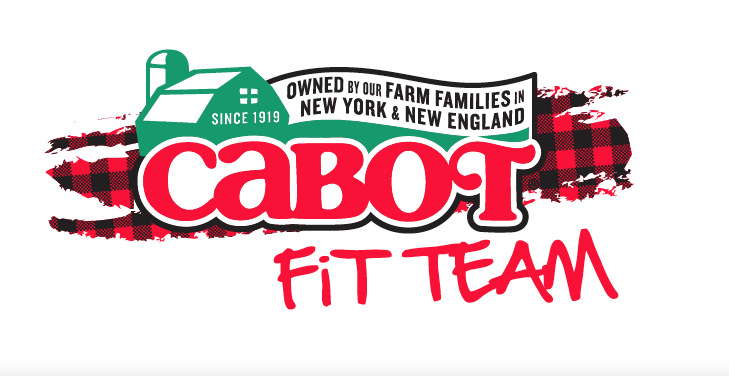 This would be a great gift for any athlete, including runner, skaters, skiiers or anyone mildly competitive. I'm using Rafflecopter for this giveaway, which will randomly select one winner in a week. I'll announce the winner here in next week's Three Things Thursday post. Good luck! Currently I have my race medals hanging on the end of a bookshelf...but I've been looking for a different way to display them. I love the Allied Medal Hangers! I hang my medals from the base of an upright ironing board. Super glamorous, eh? I really do not display them because I have no display to hang them on! I love this one and would love to be able to display them! I currently have 3 medal racks (2 from Allied), but they are FULL! Well I have a medal hanger that I got as a gift last year, but because I too am all about the bling its already filled up :( it would be great to get a new one! I use a hanger to show off my medals. A stupid, medal hanger! UGH! I need this baby! Those medals are too glamorous to be showed in a closet! Would love for my son to get one of these.. excited for his loot to grow this season! Allied Medals makes such beautiful hangers! I have one, but I'm out of room on it and need a new one badly. Awesome giveaway! I have one race medal holder, but a whole shoebox full of medals after that! We Lao just put hither in random places... On picture ledges, on the kitchen counter, etc! I have one from Gone For A Run, but its over flowing and I need a new one to continue the display of bling. I received a medal holder as a gift from my husband for all the bling overtaking our bookcase. Unfortunately, he didn't realize how many I had and how quickly I acquire them. 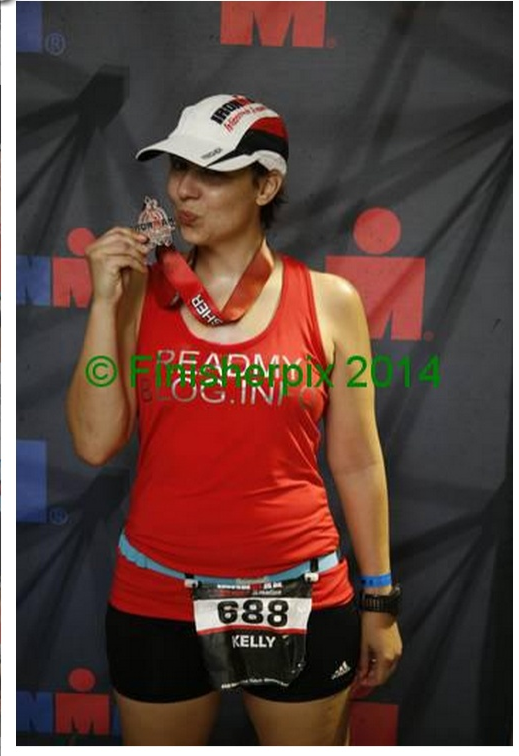 I now need a new medal holder for my incoming bling! Everywhere!! Still in race bags, hanging off my dresser mirror, and sometimes around my daughter's neck! All over: still in race bags, hanging on my mirror, or around my daughter's neck. I have mine hanging on a rack in my office bit I love the style of these better! My medals are currently hanging on doorknobs throughout my apartment. I'm running out of doorknobs and need a better solution! I have wanted to get one of these for some time. It would be a great addition to my home office. I don't display my medals right now. Currently have one pinned to a cork board. I want a display so bad! Plain White hook but I would love to Jazz it up! My poor medals are hanging on my mirror in my bedroom and need a proper home. This would be awesome to win! my race metals are just hanging off of a mirror right now, no where else to put them! Mine are hidden in a closet somewhere! My medals are hanging off a light fixture between my bedroom and bathroom. Not too glam but I do get a giggle from the glow in the dark feature on one them when I get up during the night. I have a wooden medal hanger now. I made one but it is getting full and this would be great! Awesome giveaway! I actually have a race medal holder that my dad and I built together, but it's already running out of hooks (it didn't have very many to begin with)! egads my medals are hung on doorkknobs, and hangers in my closets ... it is sooo bad!! my metals are all sort of piled on a shelf. I have one medal hanger but it almost full- great problem to have-right? great giveaway! right now, on a shelf in a pile! My medals are currently in a shoe box. I would love to win a hanger to share with the rest of the family, it would be nice to display the kids' medals. Mine are currently on a Fellow Flowers Medal rack, but I'm running out of space! I have them on a shelf. Thanks for the giveaway! I currently have mine hanging on a medal rack...but I've already started doubling up on the hooks! My medals are currently on a bulletin board, but I've been wanting a medal hanger! MY medals are laying on my shelf with my race bibs. I keep mine in a box! I'd love to win one for my friend who needs a hanger! I have a wooden medal hanger that I hang my medals on. They get put on a shelf or hung up in random places but need a real home like this. Currently crammed on a medal holder. I race for the bling too!! I also just WON my first medal too! I currently display on a nail...I need something cooler for sure! They are currently hanging off a bookshelf lol! Currently I have one and it's sitting on my shelf in my room. My Hanger is getting full, would love a new one! !